This one came from the “#MTBoS,” before it was named such a thing. These were early days, when I was still kinda geeking out over the fact that I was tweeting with k8, and Dan, and Sam. There was this energy about the whole thing for me – I’m a competitive person, and realizing there was this group of whip-smart, motivated, brilliant teachers to learn from and look up to – I wanted to impress, to be impressive. I’m pretty sure I could use my internet skills to figure out who first posed the square dartboard problem, but it’s a Monday night with a long week ahead and you’ll forgive my delinquency, here. What’s more important is what I haven’t forgotten – that I spent a long Greyhound bus ride to New York City sketching notes in a small Moleskine notebook (the same one I used to sketch tiny maps of Metro stops + the cross streets I’d find upon riding the escalator up up up and emerging onto the D.C. sidewalk). The problem posed was a challenge. I wanted to be in with the in crowd, wanted to solve the problem and share that I’d done so. Brain buzzing, headphones on, I jotted down my ideas, ignoring the seatmate eyeing my mathematical scribbles with furtive, skeptical glances. It wasn’t until the ride back that I solved the thing. I don’t think I tweeted about it. I did, however, save the work. It was posted proudly in the “cubes” at my first school, traveled with me to Nashville to get laminated and hung near my desk. Still have it, somewhere. Years and miles separate me from the girl who experienced this problem as a test of her authenticity as a math nerd, who saw a solution as signal that I was worth being invited to the table. Still something kinda magical about it, though. So. Scrolling down invites spoilers. Some MA students made an awesome documentary about teachers (and i’m in it). I should probably post this here! “At saturation level, social media reduces the amount of time people spend in uninterrupted solitude, the time when people can excavate and process their internal states. It encourages social multitasking: You’re with the people you’re with, but you’re also monitoring the six billion other people who might be communicating something more interesting from far away. It flattens the range of emotional experiences. “A restlessness has seized hold of many of us, a sense that we should be doing something else, no matter what we are doing, or doing at least two things at once, or going to check some other medium. It’s an anxiety about keeping up, about not being left out or getting behind. I think it is for a quality of time we no longer have, and that is hard to name and harder to imagine reclaiming. My time does not come in large, focused blocks, but in fragments and shards. The fault is my own, arguably, but it’s yours too — it’s the fault of everyone I know who rarely finds herself or himself with uninterrupted hours. We’re shattered. We’re breaking up. I felt a bit of discomfort with the uninterrupted time afforded me over the recent break, never seeming to make use of it the way I’d like. On the other hand, when school is in session, I am constantly fighting the feeling of fragmented multitasking in response to a busy schedule. Do you feel this tension around being fully present in your work and relationships? Do your students? What seems to work for you to reclaim space for daring plunges? Was going to make some lists of where I’ve been and what’s on deck. Typed and deleted a few things. It’s hard to be fully present. I was going to add a lot of qualifiers to that sentence like “it’s hard to be fully present when an inbox full of emails demands attention” and “it’s hard to be fully present when your phone promises an easy distraction to even a moment of boredom” and “it’s hard to be fully present when your mental to-do lists are shuffling out your ears and littering the lawn” but I needn’t bother. It’s hard to be fully present. Period. Last week at school a speaker came to talk to the students about smartphones and the effect they are having on teenagers’ development of social and emotional intelligence. Her talk really stuck with me, as I thought about all of the ways I distract myself from what’s around me, all of the ways I disengage with the challenge of being truly present, and all of the ways the things that I think help me stay connected (twitter, facebook, instagram, email, texts, etc.) — also harm me. To that end, I’ve tried to be more intentional about when and where I carry my cell phone with me, how many times in a work day I check my email (I never leave it “open.” I respond quickly once I’ve read a message, but I designate times to read and respond), and how much screen time I allow myself in the evening before bed. I checked twitter two nights ago after a busy, packed, fantastic weekend with a dear friend, saw all of the good stuff you all have been up to, and immediately experienced so much guilt and self-doubt about how I choose to spend my time. It’s this strange, competitive (embarrassing) FOMO around public professional successes. “I’m not blogging enough!” “I’m not tweeting enough!” “I didn’t make the time to read that book/article/blog post yet.” “I’m not curating mathematical art shows.” “I didn’t apply to be a Desmos fellow.” “Dan Meyer didn’t give me a shoutout in his recent blog post.” Dumb dumb dumb dumb dumb. Dumb brain. Comparison is the thief of joy. Here are recent successes that exist wholly outside the digital domain: I’ve slowed down. I’ve still had my share of disjointed, less-than-ideally paced classes this year, but on the whole the entire vibe in my classroom has been calm, focused, productive, positive. My interactions with students feel more deliberate, my conversations with colleagues less rushed. My classes are a story with a beginning, middle, and end (and – I am not the main character in this story.) In the lunch line, rather than checking my notifications on my smartphone, I try to find someone to talk to about how their day is going. As I walk around campus, I am comfortable. I check in with students I taught last year, and really sink into those conversations. I work hard as a team member on my shared courses, refining curriculum and executing lessons that allow students the chance to authentically engage in meaningful mathematics. I am busy, but I feel like I have a good sense of the work that is worth my time, and I put as much of my effort as I can into that work. Then, I put boundaries and parameters around the rest of it in order to preserve my mental and emotional health. I know there will never be enough time. But the time that we have is a gift. Trying oh-so-hard to slow down, and enjoy it. The school year is officially underway, with one week in the books. Because we are on a block schedule, this means I’ve seen each of my classes twice. This year, I’m teaching 1 section of Geometry, 1 section of Precalculus, and picked up 2 sections of Algebra 2 Honors. I’m super excited about my schedule, the mix of old and new, and the opportunity to teach an honors class at MA. After playing with this puzzle long enough for the class to make a conjecture about how to figure out the 2 numbers (and putting a student on the spot to figure out MY two numbers), we did brief introductions, then moved into our next activity. I decided to use this NRICH “Algebra Match” activity that has students silently, in groups of four, trade away cards with mathematical expressions until each group member has a matching set of 4 cards. The rules? Here is one of my classes busy at work on the activity. What are some of the benefits of group work in math class? What are some of the challenges? What do YOU need to be successful during group work? From your peers? From me? “I need a diverse group of learners. I need some support because I usually take on a larger workload and get stressed or overwhelmed. What individual goals do you have for yourself as a mathematician during group work this year? To be honest, I wasn’t sure how this activity or the debrief afterwards was going to go, so I was pleasantly surprised to see that the task was sufficiently challenging (mostly because of the “no talking” requirement, although it did give me a sense of which students might be a little rustier with their algebra or need to rely on scratch paper vs. working in their heads) AND that they really dug into the discussion afterwards in a way that I think helped establish some class norms for group work that will pay off throughout the year. At the end of class, we returned to the “Think of 2 Numbers” trick, where (again, stealing Jamie’s idea) the students had to prove algebraically why the trick worked for homework. That was all just Day 1! Day 2 was even cooler! I’ve already written quite a bit and want to get back to enjoying my Saturday (it’s a beautiful day in the Bay Area! ), but here’s the problem we tackled to start class on Day 2 and OH BOY did the students take it even farther than I had expected. This is going to a fantastic group, and a fantastic year. I’m in love. Desmos has been working to make its graphing calculator fully accessible for visually impaired and blind students. As of now, if you enable voiceover on your device (command + F5 on mac), Desmos will read the expressions in a way that “sounds like math” (ex: reading sin as “sine” instead of s-i-n) and gives students clues as to where they might be in the expression (ex: subscript, superscript, reading the opening and closing of grouping symbols). It is also capable of “playing” a graph to give a pitched audio representation of whatever has been graphed. [Predictably] I immediately set out to use the feature to write a song, ignoring all other directions about what we were “supposed to be doing.” James and I worked on it during our morning work time, with serious insight and help from Chris and Sam to get us over a few hurdles. I loved the experience of playing with something that I had no idea how it worked by experimenting (pitches compared to y-values, time compared to x-values, etc. ), trying and tossing out ideas that ended up not working, and I ended up learning some new things about how to use Desmos (lists of functions, anyone?) along the way. Desmos also premiered a few new things which others have written about – a new layout on the teacher.desmos.com landing page, bundles of selected+sequenced activities with notes for teachers about how each lesson builds on the preceding ones, and the “labs” option which enables teachers to use the brand new marbleslides and card sort features for activity builder lessons. The MTBoS has already set to work creating quite a few activities to test out the new features, and I can’t wait to think about how I might incorporate these in my own lessons for the year ahead. Are there more exciting words? I’m at the board after some time spent in groups working on the warmup, going over a few answers and trying to clarify big ideas. They’ve stopped their work to tune in – quiet moments with eyes on me are so much rarer these days. Some kind of magic has happened in this happy, focused A block Geometry class this year. They work hard. They persist. This has so little to do with me – no one has told them they can’t be good at math, no one has told them it’s boring. So they believe they are capable, they expect to enjoy math class, and they are and they do. (I hope!) I give them good problems and explorations designed by the Geometry team and they set to work. I am so secondary to the work they do in my room. My inexperience teaching Geometry actually feels like a gift – this combined with 3 preps at a new school (which means I can’t obsessively overplan each lesson) – means that the questions they ask sometimes surprise me; the solutions they offer often delight me. I pause (we all pause.) It’s that moment in the music where the wind players breathe before the downbeat. 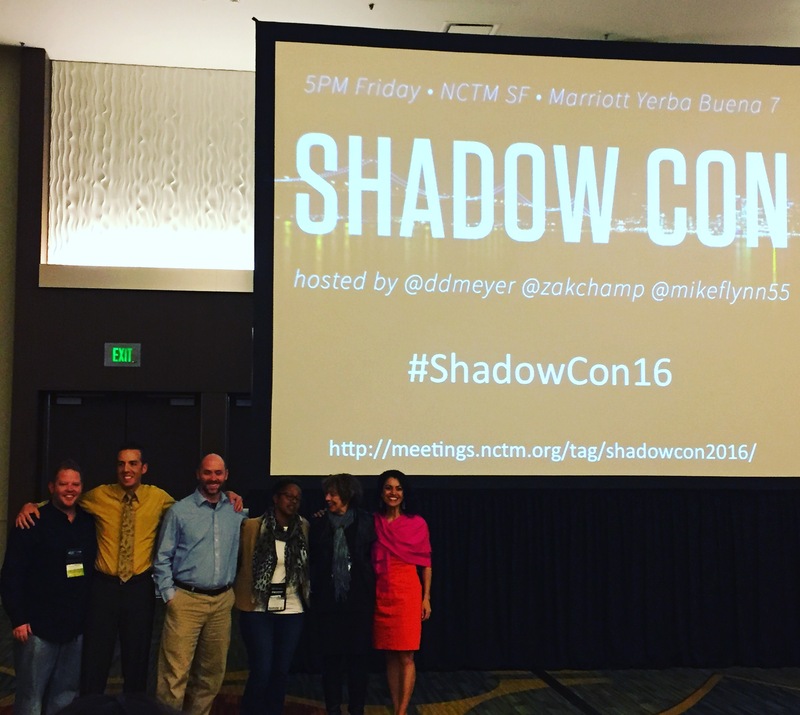 Rochelle Gutierrez’s #shadowcon16 talk is up – check out the video. Blend that with Kaneka Turner’s talk, and ask yourself – who gets invited to the math party? Who gets the invitation to be “good at math?” How can I extend the invitation? I believe to my core that all students are capable of learning about and engaging in meaningful mathematics. It is imperative I examine the ways in which I inadvertently send the wrong message to students about their own ability or access to math, and the way that gets bound up with other cultural messages about identity and status. Go listen and learn. Happy Thursday.